With most major football competitions finally getting underway in the next few weeks, and the Eredivisie 2011/12 kick off just a few days away, there’s just enough time for one more ‘soccermetrics’ related post. As you are probably aware, ‘soccermetrics’ aims to measure the performance of teams and/or players during a football match. The fact that it’s called ‘soccermetrics’ rather than ‘footballmetrics’ might support the argument that these kind of sports sciences found their origin in the United States, where the beautiful game is referred to as ‘soccer’ and not ‘football’. The sport most known for the use of statistics is perhaps baseball, and Michael Lewis’ book Moneyball has emerged as a pivotal work, raising awareness for the use of statistics in sports, in particular during recent years among football enthusiasts. The fact that mainstream use of sports statistics started with baseball, rather than with any other sport, seems strongly related to the ‘stop-and-go’ nature of that game. Each pitch starts from the same setup, from the same position on the field and with readily measurable outcomes. 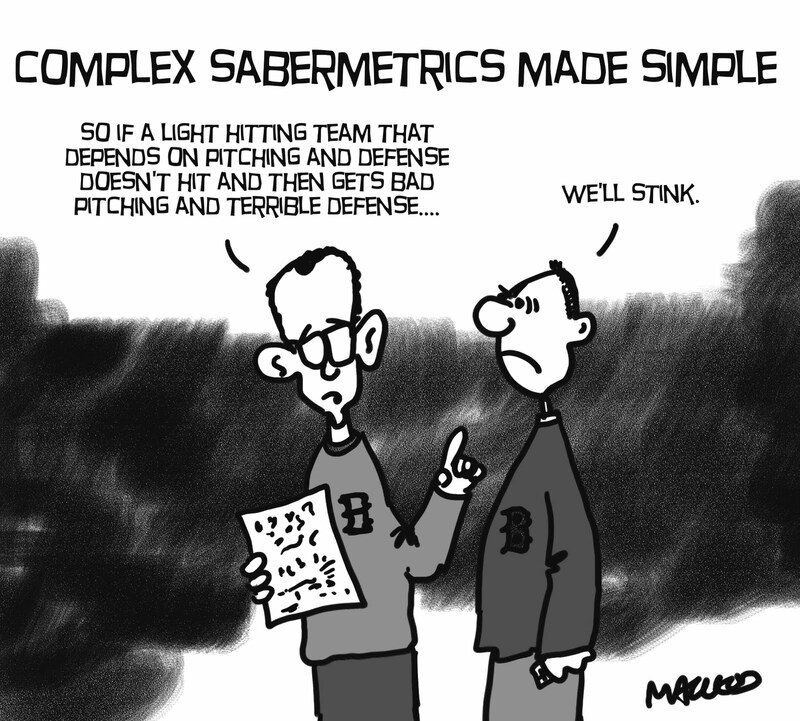 Even though, turning baseball data into comprehensible information that accurately represents performance, remained a challenge for many years, earning the term ‘sabermetrics’ in the process. The acceptance of statistics in baseball has familiarized sports fans with regular use of this kind of information and slowly, but surely, other sports adopted regular use of stats. Among these, American football and basketball, two sports that mix the stop-and-go elements of baseball with the fluidity of football. It’s those two sports that we can use as examples of how to analyze a fluid ball game like football. Plainly accepting the fact that “football is too fluent a game for any sensible analysis to be made” will serve as a self-fulfilling prophecy. We can learn from the progress made in other (partly) fluent sports. One of the key differences between analysis of basketball or American football and analysis of football is the approach towards possession. The first statistics to be adopted in the mainstream football world has been possession percentage. Most, if not all, regular viewers of football matches will be aware of the value that’s been attributed to possession of the ball. To cite Johan Cruijff on this subject: “As long as we’ve got the ball, they can’t score.” This early adoption of possession in terms of ‘time on the ball’ is slowly losing ground as recent analyses have shown no clear relation between the amount of possession and match outcome. In other words, Barcelona’s out-and-out dominance in terms of possession and passing against Mourinho’s Inter in the 2010 Champions League semi-final, resulting in them losing the tie might not be the exception, or at least, not anymore. Skeptics might argue that possession is hard to define within football, as turnovers are everywhere, but this is a matter of convention. Defining the team in possession as the team that last made a passing attempt would work. Any tackle or clearance by the defending team doesn’t interrupt possession unless they make a passing attempt from it. A goal scoring attempt doesn’t automatically lose possession as saves can lead to rebounds and corners are nothing less than a rebound too. Set pieces are passing attempts taken either at predefined positions (corners, goal kicks, etc) or anywhere else (free kicks). How should we analyze possession? Again, learning from basketball and American football, looking at the sheer number of times a team had possession of the ball, rather than how long they held onto it! What is a football match more than two teams trying to put a ball into each other’s net, while preventing that happening to themselves? Well, the objective of each time a team has possession of the ball is exactly that: put the ball in the net. A problem in drawing upon the examples of basketball and American football is the fact particularly basketball is a high scoring game. With football being an extremely low scoring game (which sports regularly see 0-0 scores anyway? ), calculating the amount of goals per possession would not work. To increase the incidence rate of our outcome we could look at shots rather than goals, but this would reward teams opting to quick shots over teams preferring to create the best of scoring opportunities. Referring to an earlier post, we would best use the chance that any goal scoring attempt produces a goal. An open play shot from just outside the area, just left of the axis of the pitch will on average be a goal in 14.1% of cases, hence would be worth 0.141. A close range header from a corner finds the back of the net in 38.2% of cases, for a worth of 0.382. This way, we could easily present the value created per possession. This metric would enable a fair comparison of teams playing different playing styles. Other options of this form of possession analysis are to compare the value created from different ways to start possession. We all know that winning the ball in the opponent’s half is a valuable thing, but on average how many goals does your team score from it? This metric also enables us to quantify where a team’s possession starts. Again using the example of Barcelona: winning the ball from them is tough, but a big issue is that you’ll almost never do that in their half due to their pressing game. This metric would allow the effect of different tactics in such a situation. At present, data to carry out this kind of analysis does not seem to be as widely available in football as it is in other sports, but the emergence of stats in football is growing as a whole, which is a step in the right direction. Now let’s try and raise the quality of the information they provide! I would like to know if there is research done to compare chances of scoring goals in relation to possession in the last 30 meters or in relation to the number of succesfull forward passes. Again I have to refer to the US here. The excellent Sounder At Heart blog recently compiled an analysis of MLS data, showing that a higher passing percentage in the final third correlates with more shots. The low scoring aspect of football makes it harder to judge the correlation between passing percentage in the final third and goals in the same data set. It seems dangerous to conclude that a higher pass completion in the final third contributes to more goals being scored. Talking about possession in football, you can’t go without the Barça-Inter example, where Barcelona had the vast majority of possession – and won the match, a fact widely overlooked. Regarding to possession related to outcome, one can also point at the Spanish national team, also fond of possession, almost always winning – or: almost never losing. Tiki taka as a defensive strategy. The “As long as we’ve got the ball, they can’t score” line looks more to be a Van Gaal one than Cruijffian speech, since Van Gaal wanted his players to involve the goal keeper just to keep the ball theirs, whereas Cruiff more advocated the nowadays Barcelona way of playing: as long as the ball is in their part of the field, they can’t score. Which I think is more true than the other line. Keep going with your blog though, I your analysis of (Dutch) football! Don’t try to reinvent the wheel. Thanks for adding these articles. I’m afraid were discussing two different things here and I don’t think that re-inventing the wheel applies. What’s been discussed above relates to metrics defining performance in a match, turning possession into a goal scoring chance and quantifying that chance. The research performed in the articles you listed relate to post match outcome. It is a good thing that this type of research is available, but using matches won or goal scored as outcome parameters limits the application of these results to entire matches, instead of fractions of matches, here defined as possessions. For this kind of analysis the result of one game has no relevance. Billy Beane hated the play-offs for this reason. As argued in the linked article the number of shots on goal is in my opinion sufficient. I fully agree, looking a individual match outcomes won’t be relevant in any sort of analysis, that is why pooled data of the entire English Premier League data was used in the previous post on defining the value of individual chances. The problem with looking at the number of shots is that it denies the difference in the type of shots teams take. In the past Eredivisie season ADO scored with 17% of their shots versus VVV’s 9%. Taking the number of shots as outcome parameter neglects this important difference. I am from the US and have done data analysis for baseball, football (American..haha), and basketball, so I have always wondered why there is never a focus on statistics in soccer. I think this part of the game will revolutionize in the next few years. The best way to do this would be to look at each individual touch as a ‘play’ similar to a pitch in baseball. Each touch has three stages: receiving the ball, keeping the ball, giving the ball. Data that needs to be compiled is where, how, when, who, what. Where did they get the ball? How did they get the ball? Who did they receive the ball from? How long did they have the ball? Who was guarding them? What did they do with the ball? What was the result? Where did they pass the ball? Who did they pass to? Many more questions that all must be answered with empirical data. Each possession consists of a string of ‘touches’ by individuals on the same team. You could then get so much data from this by doing analysis on how each player affects their teams possession and overall attack. If you can’t tell, I could talk about this for hours, and I am currently in the process of getting a complete data model for individual possession analysis with the goal of developing a formula on how well a player impacts the game based on their possession. Brilliant post. I have concluded however that analysing footbalm mighy require the criteria above being used by many peiple simulataneously before being fed into something. Very interesting to read all your posts. Most coaches in Holland define the game in 4 parts. Ball Possession Opponent, Offensive Transition, Ball Possession, Defensive Transition. You can define BPO as: we (our team) is organised, we are in our defensive shape. Same for BP: the opponent is organised. Conclusion can be for transition. DT: We (our team) are not organised, priority is to be asap in our defensive shape. I guess you bloggers/analists have analysed how many goals are scored in possession (excluding dead ball situations) and transition. As a coach I am interested in analysing data and how to use the data to help players and teams to perform to their max. Read The Moneyball and I agree with Matt Stigall that this part of the game will revolutionize in the next few years. Matt: I am cutious about your data model for individual possession analysis with the goal of developing a formula on how well a player impacts the game based on their possession. Former Sparta’s keeper and Louis van Gaal’s assistent? Sorry that I’m a little late to the discussion. One of the difficulties in coming up with metrics for football (or soccer if you will) is the number of parameters are much higher than for other sports for which this has been done. Most baseball metrics involve a small defined number of players (pitcher, hitter, fielder) and there are lots of games in a season with a high number of events per game. This makes statistical analysis much easier and more reliable once the key factors have been defined. You can also go back retrospectively and look across past seasons and different eras of the game. I do think that there is a good opportunity here to come up with some metrics that would be of assistance to both coaches and fans of the game but it will require some thought. Goal scoring opportunities is intuitive but how should routine field play be defined? Are their microzones on the pitch that are more important than others. For example if a team loses possession of the ball in the opponents 1/3 of the field, a potential goal scoring opportunity is lost but it is less dangerous than losing the ball in your own 1/3 to a pressing team and conceding a goal scoring opportunity (certainly it should be easy to compile statistics on loss of possession and get some idea of which players are at fault and in what areas of the pitch). Some statistics will clearly change over the course of the season as a result of identification of opposing team preferences. One area that is of interest is how teams build up the attack from the back. Barca very rarely make back passes to Valdez, relying on the superior ball handling skills of their central defenders and holding midfielder. Other teams involve the keeper much more. Ajax (the team I am most familiar with) relied heavily on Vertonghen to bring the ball up as Enoh was quite poor handling the ball in the defensive half. Are long kicks by the keeper to start the offense at all effective (certainly they weren’t when Oliver Kahn was playing at Bayern!)? From an overall team perspective, is the “rope-a-dope” defense (absorbing the opponents attack by playing everyone back as Inter did vs. Barca) effective? This should be more manageable to study. A good point about possession was Man City vs Swansea this weekend. Swansea had 57% of possession (70% in the first 20 mins) but only managed 8 shots scoring none, Man City had 30 shots scoring 4. The difference relates to the performance in the final third (or what is somtimes defined territorial advantage) – Man City had 60% to 40%. Swansea made only 18% of their passes in the final third. Hi I am currently studying a BSc in sports coaching at edge hill university in the uk. We have been asked to analyse a football match. I will be focusing on possession and passing. As anyone or could anyone suggest a good hand notation to use for this?